iPECS eMG800 is Ericsson-LG Enterprise’s response for SME challenges and needs. The result is an optimized SME solution built from the common challenges of SMEs in mind such as: Growth, Flexible IP converged capabilities, Unified Communications, Ease of use, Mobility, Single management, Scalability, Reliability and Cost-effectiveness. iPECS UCS Standard server is built into the eMG800. Users can use video, IM, audio conference, visual voice mail, as well as voice calls on one platform. 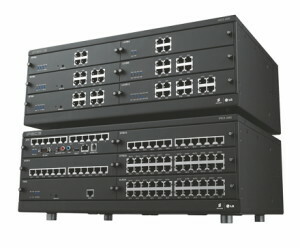 An external server, iPECS UCS Premium server provides even more collaboration features. Pre-packaged embedded features and applications increases business competitiveness with effective communications with less cost. Those enhanced features and applications help users build a unified and efficient communications solution designed to fit any users’ business situation. iPECS UCS mobile client, Mobile Extension, DECT, and Wi-Fi terminals are optimized with the iPECS eMG800. Mobile communications are available both in and out of the office. iPECS eMG800 supports complete single network IP solutions with high-capacity VoIP to protect your investment and seamlessly migrate to an IP converged world as an innovative Hybrid platform.